Congratulations and good luck to our friends from London and Maddie’s 4-H prep club, Michele, Gordon and their partners, who have just opened a new Cluck-U in Somerville, New Jersey, where Roxy went to high school way back when. Come out today — Saturday, July 11, 2009 between 12 noon and 4pm – and join them in celebrating the “OFFICIAL GRAND OPENING” for their new venture. Grand Opening Party today – Saturday, July 11th. 911 Challenges from noon till 4:00 PM. The Rock of New Jersey’s own Lindsay Klein, from 105.5 WDHA, will be broadcasting live from noon till 2:00 PM. Tons of giveaways including Blu-Ray player, Wii Fit, Motley Crue tickets, much more. Come see Somerville’s Fire Department compete against other area Fire Departments in Cluck U’s own 911 challenge. Think you can rank? 10 wingers covered in 911 sauce eaten in 5 minutes! Bragging rights, commemorative T-shirt and your picture on our Wall of Flame! Bring the family, bring your friends, bring anyone! The 2008 Somerset County 4-H Fair Starts Wednesday, August 13th! This year’s Somerset County 4-H Fair promises to be bigger and better than ever, attracting tens of thousands of visitors with its wholesome mix of arts, entertainment, agriculture, animals, science, food, fellowship and just plain free family fun. Maps and schedules of daily events such as dog, horse and livestock shows are available in the information tent. Twirling, go karts, rockets, clowning, model airplanes, R.C. cars, model trains and other 4-H clubs compete and perform. The Arts Tent, Science Tent and Prep Tent (for the youngest 4-H’ers) are packed with exhibits, activities for visitors, demonstrations and performances. Ten other 4-H tents house a variety of animals including dairy cows, beef, alpaca, horses, dogs, herpetology, sheep, goats, poultry, rabbits and small animals. Most animal tents have a petting area and information about how to join 4-H.
Somerset County Government, Raritan Valley Community College, Veterans Services, Rutgers Cooperative Extension, Somerset County Library and other non-profit organizations and commercial advertisers have displays, information, contests and free gifts. Under the big top, over 20 community organizations offer a wide variety of meals and snacks. All day, professional and amateur entertainment can be enjoyed. There will be displays to emphasize the role of agriculture in N.J. The Somerset County Board of Agriculture will present antique farm equipment and New Jersey Christmas Tree Growers will exhibit a large variety of evergreens. The 2008 Somerset County, NJ 4-H Fair runs Wednesday, August 13th through Friday, August 15th. It is open from 10 a.m. to 10 p.m. all days at North Branch Park, Milltown Road, Bridgewater, located between Routes 22 and 202. To make getting in and out of the fairgrounds as easy as possible, free shuttle buses run from 9 a.m. to 11 p.m. each day of the Fair from Raritan Valley Community College Rt. 28, North Branch. Click here to print a complete schedule of events for each of the three days. And late in the afternoon of Wednesday, August 13th, you can look for London, Maddie and me in the 4-H Prep Club Cotton Candy Tent! One event that totally takes me back to my childhood is the 4th of July Fireworks Celebration held every year at North Branch Park (otherwise known as the 4-H Fairgrounds) in Bridgewater, NJ. As a little girl growing up in Branchburg, New Jersey, I would go with my parents every year, setting up blankets and lawn chairs on the hill and running around with all the other kids until it got dark enough for the fireworks. The tradition didn’t end even when I was a surly teenager, though I would hitch a ride with my parents to the park and then pretend I didn’t know them until it was time to go home after the last of the fireworks exploded overhead. According to a long standing annual tradition, Rex and the girls and I spend the week from his birthday through the 4th of July at our beach house in Bay Head, New Jersey every year, so I haven’t been to the Independence Day celebration near where I grew up in Bridgewater, NJ, for at least 15 years. Even without Roxy and family, it is still one of the best fireworks displays in the Morris and Somerset County area. 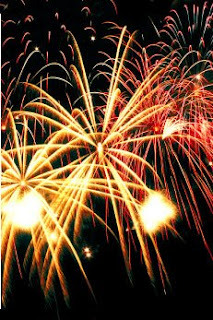 This year’s event will be held on Friday, July 4, 2008, from 5:00pm to 11:00pm, starting with a tropically themed family festival that includes live musical entertainment by “Verdict” and “Smooth.” Fireworks start at 9:30pm.